On Deck - How good is your source of marine weather information? Many marine weather websites and apps claim to offer the best information for your needs but they're not all the same. They take different approaches to where they source their information, the level of detail presented, and how it is monitored and updated. Using inaccurate or unsuitable weather information can ruin your boating or fishing trip, or at worst, put your safety at risk. We suggest running through these quick checks to make sure your chosen weather app or website is providing you with all the information you need for decisions and to stay safe. Does it show marine weather warnings and hazards such as thunderstorms, squalls, and fog? Knowing about hazards in the marine environment is essential for your safety. The Bureau of Meteorology issues a range of warnings for marine areas when dangerous winds and waves are expected. Warnings displayed in apps or on websites should be clearly marked with the time and date of issue. Look for Marine Wind Warnings—issued up to 42 hours in advance and updated every six hours. Coastal Waters text forecasts also include expectations of thunderstorms, squalls and fog when relevant. Does it clearly show the exact location or area the weather forecast covers? Wind and wave conditions can be very different from one location to another. The website or app should tell you what location or area is covered by the forecast (e.g. the specific latitude and longitude or distance to the coast). The forecast should be specific to the marine environment, describing the wind, weather, sea and swell over the area. You should be able to find out the wind and wave conditions for inshore and offshore areas, as conditions can vary markedly with distance from the coastline. Does it show when the weather forecast was issued, and can forecasts be updated at any time? The weather is constantly changing and forecasts can quickly go out of date. Forecasts should be published regularly and draw upon the most recent data available. Importantly, forecasts should be updated if the weather situation changes. Some weather providers monitor weather patterns 24 hours a day and are able to update their information quickly during rapidly developing weather events like tropical cyclones, cold fronts, and thunderstorms. Other weather providers only display forecasts produced from computer model output, there is no routine monitoring, and the forecasts are not updated if the situation changes. Issue times are generally displayed alongside the forecast. You may need to refer to a help page to find out whether the provider can update the information at any time. Does it show the source of the information? The website or app should describe where the marine warnings, forecasts, and observations are sourced. Note that just because the Bureau of Meteorology is mentioned as a source of information, it doesn't mean all of the information comes from there. Does it provide the relevant content and tools to help you perform the Five Vital Weather Safety Checks? 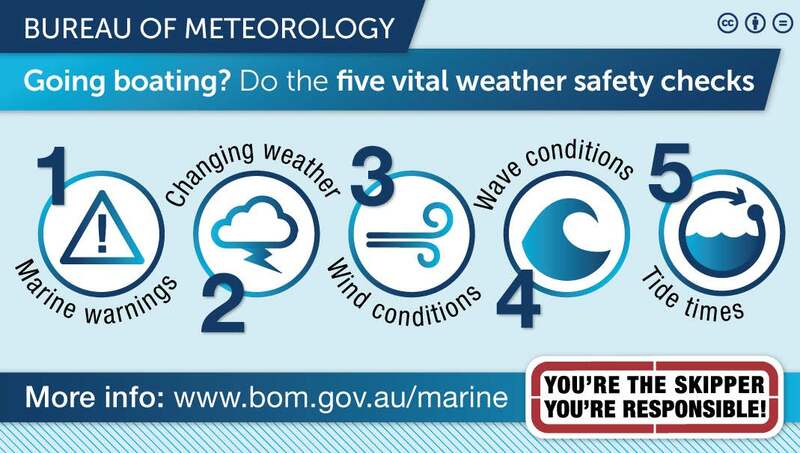 The Five Vital Weather Safety Checks are endorsed by the State and Territory marine safety agencies. These checks encourage boaters to familiarise themselves with current warnings, expected winds, waves, weather and tide conditions before they head out on the water. Remember it's normal for wave height and wind speed to fluctuate out on the water. Marine forecasts should note that maximum waves are higher than the significant wave heights and wind gusts may be stronger than the averages given (or provide wind-gust values). Wind speeds should be presented in knots for marine purposes.